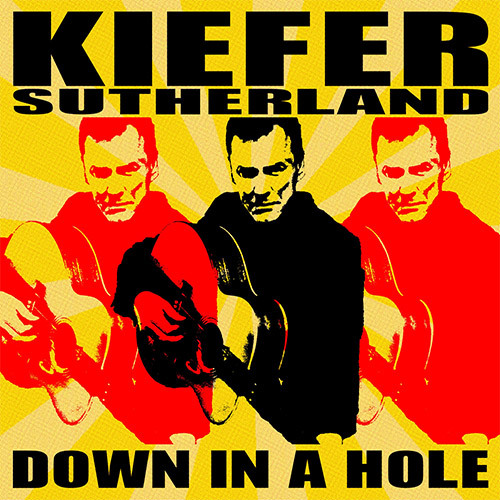 Who knew that Emmy and Golden Globe Award-winning actor Kiefer Sutherland, best known for his starring role on the Fox series 24, and movies like Stand By Me, The Lost Boys, Young Guns and more, could actually sing and play music? The actor/singer/songwriter releases his debut album, Down In A Hole, on August 12th and brings soul, grit and baritone to country music. Sutherland’s brand of country leans more towards Willie Nelson and Chris Stapleton than Luke Bryan and Jason Aldean. Not only was there not one electronic loop used for this album, but he has co-written story songs that actually have substance. This is such a relief as more artists are worried about joining the bandwagon than changing the landscape again. Sutherland’s voice is reminiscent to that of Joe Cocker’s gritty, raspy, soulful and passionate chops. It compliments the fresh sounding instrumentation from an album that was produced by 80s rocker Jude Cole. The 11 song collection kicks off with the album’s second single, “Can’t Stay Away,” a heavier bluesy love song. It includes a killer slide guitar solo in the vain of Bonnie Raitt. It’s a standout track, in my opinion and could gain some mainstream acknowledgement if country radio would spin it. “Not Enough Whiskey,” the album’s first single, is a six-eight slow sad song. It represents traditional country music very well with a prominent steel guitar throughout. Of course, what country song would be complete without a whiskey drinking fool singing about a love gone wrong? The album’s title track is a rocker. It changes direction a few times throughout the song. It starts as a six-eight mid tempo rocker but then gets faster midway through before changing back to its original feel. However, the last minute or so of the track gives it a complete overhaul by gaining speed again and ending big. If you’re a fan of traditional country mixed with a modern digital sound, then you’ll love Sutherland’s album. He has recently wrapped up a North American tour where he sold out venues across the U.S. and Canada and captivated audiences left and right. Acting isn’t taking a backseat to the multi-talented actor. Sutherland’s upcoming ABC series Designated Survivor premieres this fall on ABC.